A simple diet alteration such as replacing all-purpose flour with white whole wheat flour can be an easy step toward a healthier diet and lifestyle. The health benefits of a diet rich in whole grains is amazing. Diets rich in whole wheat and grains play a major role in reducing the risks of cardiovascular disease and type 2 diabetes, according to researchers at Wake Forest University School of Medicine and The American Diabetes Association. Some epidemiological studies have found whole-grain intake to be associated with decreased cancer risk. The abundant antioxidant offering provides valuable protection against free radical damage to our cells. The whole grains council defines white wheat as a whole-flour, including the bran, germ, and endosperm, made from white wheat. Think of it is as albino wheat if you will, that packs the same whole grain healthy punch as regular whole wheat minus the red color genes. Gold Medal asserts their white whole-wheat flour is a 100% whole-grain. They mill the flour from the very beginning preserving the vitamins and minerals, complex carbohydrates, and phytonutrients (nutrients naturally found in plants) found in whole grain wheat. These components work together to help support a healthy lifestyle. White wheat is milder in flavor than regular whole wheat. Experts consider white and regular whole wheat to be the same nutritionally. Products made with white wheat require less added sweetener to attain the same level of perceived sweetness. In my experience, baking with white whole wheat is no different from using AP white flour once perfected. Originally, I substituted the two flours equally and found that an increase in liquid was necessary. Adding a tablespoon or two of the required liquid was sufficient. A reduction in flour by 1 – 2 tablespoons could also remedy the need for added liquid, according to flour manufacturers. Gold Medal recommends beginning by substituting 25% to 50% of the white flour with white whole-wheat flour. If you are concerned about the conversion of a specific recipe, it may be more practical to follow the Gold medal recommendation. I found that bread and sweet muffin recipes prepared without the liquid addition resulted in a lower rise and denser texture. It is true baking with white whole wheat flour requires less sugar. The reduction of sugar resulted in a lighter crust and softer texture and yet another step toward a healthier lifestyle. The reduction of sugars along with a tablespoon or two of added liquid produced a wonderful home baked product. Thanks to myblogspark and Gold Medal not only did I receive this beautiful blue Retro Ceramic Cookie Jar but also a coupon for 5 lbs. of Gold Medal White Whole Wheat Flour and a set of White Wheat Baking Recipe Cards to sample and review. One winner will be chosen on Friday, September 23, to kick off the first day of autumn. Good Luck and Let the baking begin! PreviousA Legal Loan or Loan Sharks? I love using this Gold Medal White Wheat Flour. This is the best flour for my cakes and muffins if I want to bake not using the ready mixed recipe. Thank you, hope to win this. Kathy, I don’t spend much time in the baking aisle of the grocery store (except around the holidays). I was totally unaware that Gold Medal made a white whole wheat flour. I’ll have to look for it because I really am trying to cook healthier. I totally agree Whole wheat are always the best, wish I could get this brand in India. I would love to win this because I love baking, and white whole wheat is new to me – looks yummy. I have not tried the White Whole Wheat Flour, however it would be great to try in baking with my kids! I just retweeted http://twitter.com/#!/notsoperfect2/status/115331209579601920! We already use whole wheat flour in baking, but it just seems to make anything that is supposed to be uber delicious into lead bricks (very heavy). Brownies are not supposed to be paper weights! 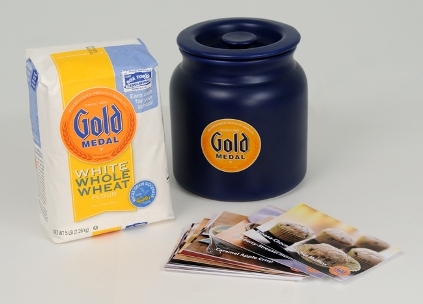 Would love to have the chance to try Gold medal Whole wheat White flour! and I tweeted http://twitter.com/#!/MikeyRSinglemom/status/115429446382653440. Thanks for this opportunity to win! Because it is healthy and it is loaded with antioxidants! I want to win because I have been doing a lot of baking and I would like to include some whole wheat. Thank you for offering this great giveaway. I would like to win because I recently had a bypass operation and now have to eat a lot of wheat products. I would love to learn how to cook with this so that my family would enjoy it. I would like to win this because I love to bake… but normally it’s not with whole wheat flour.. and so I’d like to try using it in my recipes to make them just a little bit healthier!